Once again, fantastic SG-1000 cover art lures unsuspecting children into the clutches of a mediocre title. I initially misread Orguss as “Or-cuss,” which made me think of the underused phrase “Ornery Cuss.” This in turn led to me calling my wife an “ornery cuss” for no reason, which made her laugh (because she’s awesome), but not before she gave me the artificial stinkeye, which made me laugh. Yes, thanks to my inability to read, Orguss brought my wife and I together through the healing power of laughter. “Surely,” I declared loudly to my wife and cats, “Orguss is a king among games!” But like many misguided declarations one utters after a brief period of mirth, my words turned out to be false. Orguss mixes intriguing ideas with bland shoot-em-up gameplay, making for a nimble street rat among games, at best. In Orguss, you play as a robot who can shapeshift into a starship. Both forms have their positives and negatives: the robot is able to shoot faster, but he moves slower and his lengthy frame is ripe to absorb enemy shots; the starship moves quicker and can easily avoid enemy fire, but he can’t shoot as quickly as the robot. The dual-form mechanic is initially awesome, until you notice the time limit in the middle of the screen. You only have two minutes and thirty seconds to complete each round. This is barely enough time to get to the boss and defeat him if you have the faster traveling starship equipped at all times. If you choose to use the easy-does-it robot throughout the round, you’ll run out of time and die for sure. Perhaps Sega intended for the robot to be a last resort maneuver; like if you felt overcome by enemy ships, morph into the robot, destroy ’em all, then quickly morph back. The problem with this theory is that there’s rarely ever more than two enemies on the screen at the same time. Even in the ship form, they’re easy to take out. So why even make playing as the robot an option if you can’t use him for the duration of the round? Had this transforming mechanic been implemented more thoughtfully, it would have distracted from the tedious early shoot-em-up gameplay. Each round consists of moving through three separate backdrops – forest, ocean, and the not-too-distant apocalyptic future – while enemies come at you two at a time. 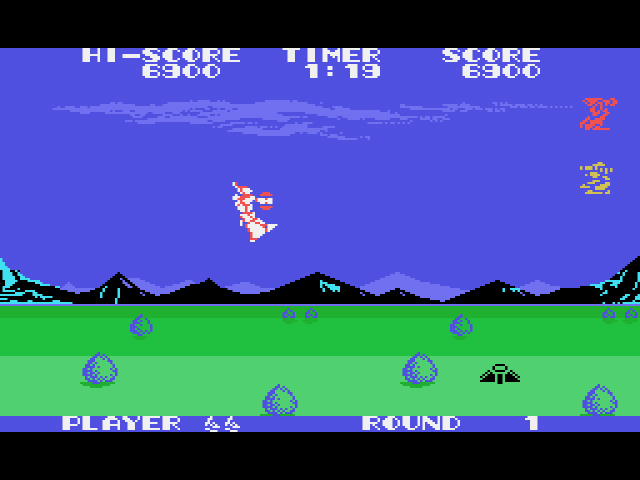 Their firing patterns are erratic, sometimes they linger on the screen until you kill them, other times they fly away. Once you arrive at the boss, the game automatically transforms you into the robot. Eight ships fly at you, all at one time. Destroy them and the next round – which is exactly the same as the first round, except with ground enemies firing at you – begins. Orguss is based on the anime series, “Super Dimension Century Orguss” that aired from 1983-1984 in Japan. Rather than give a brief synopsis of the series and pretend like I know what I’m talking about, follow this link to the anime’s Wikipedia page to learn all about it. 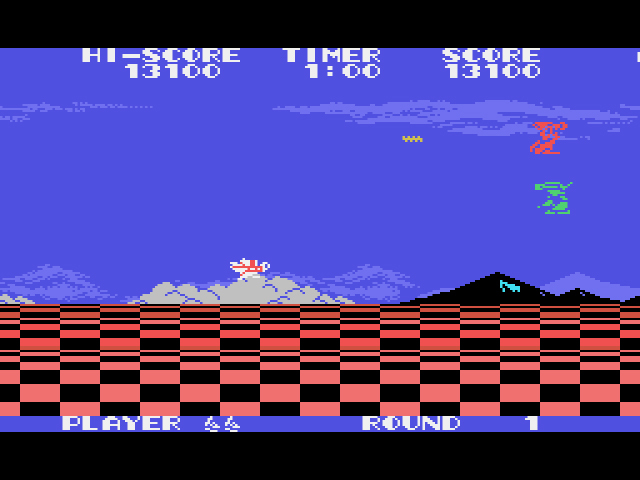 Orguss‘s 1984 release was as timely as could be, though the game probably wasn’t as impactful as the SG-1000’s first licensed title, Golgo 13. Still, props to Sega for securing two hot licenses and making them their first releases of 1984. Sure, neither game is very good, but that’s not necessarily a concern when it comes to making money, right? Damn I would have freaked seeing Orguss as a kid. 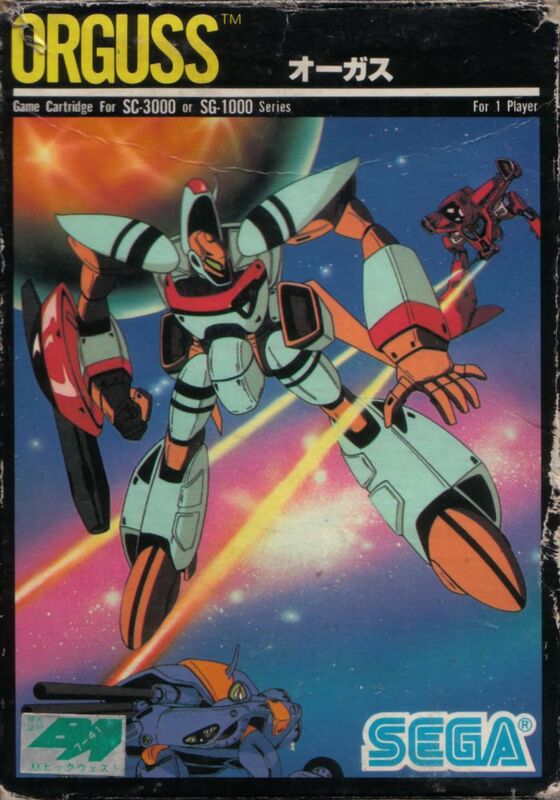 It was one of the few early animes that made it to the US in the early days on VHS. And I would have been disappointed too. In a way I was. A later release on Sega card that I had as a kid that was really similar was Transbot. I bought it for exactly the same reason. Cool a transforming robot. It was almost exactly like this game. And just as disappointing I’m sure. According to SegaRetro, Transbot is a “spiritual sequel” to Orguss. So there ya go!